A simple recipe resulting in a mouthwatering and distinctive product. 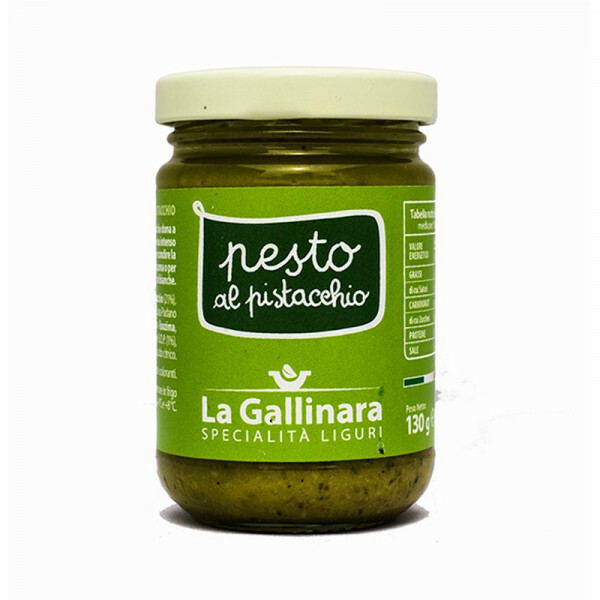 This specialty pesto is an easy-to-use, ready-made condiment ideal to match any quirky pasta dish, meat or fish based, or simply spread on toasted bread. The pistachio pesto is a domain with a fresh and aromatic taste that enhances the unique and unmistakable taste of these fruits. Made only with selected high quality ingredients. The pistachio pesto is the perfect condiment for fresh pasta, but can also be served with toasted crusty bread to serve as tasty snacks. Pistachio (21%) , almonds, olive oil, Grana Padano (milk, egg-protein lysozyme, salt) Genovese basil D.O.P. (1%) Garlic, plant , fibre salt, citric acid. MILK, NUTS.